Introducing our newest showroom sink; the Bradley Terreon® Classic Juvenile Height Washfountain. This semi-circular washfountain is one of the most unique sinks we carry. Not only is this sink style a distinctive fixture that transforms any restroom into a contemporary space, but it’s also highly efficient in terms of space, water saving, and usability. Bradley Washfountains function much differently than most sinks. The semi-circular washfountain shown services 3 individuals at once. Other circular units can service up to 8 users at a time. 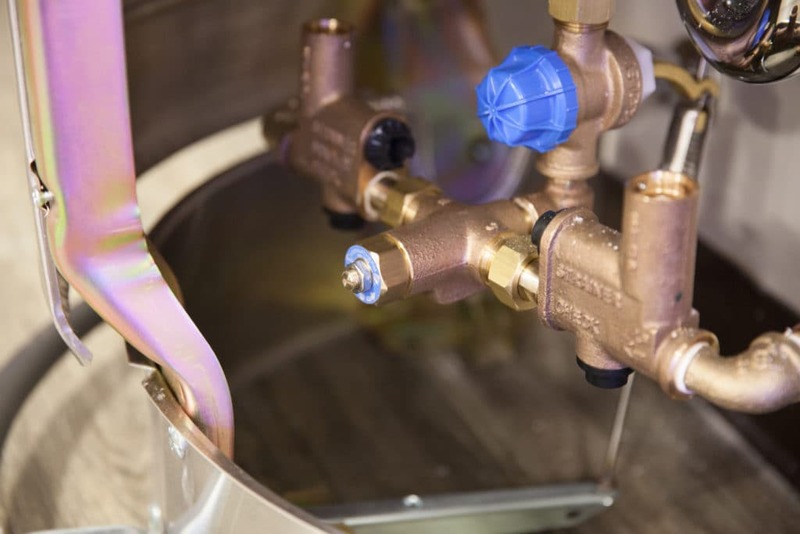 This multi-user design requires only one water and waste connection, which simplifies the installation and servicing of the unit. It also makes it more cost-effective with less plumbing connections required. When three people are using the washfountain, which operates at 3.0 GPM, the water usage averages out to 1.0 GPM per person, which is less than half the 2.2 GPM in many standard, single user sinks. This unit functions with a foot pedestal that the user presses with his or her foot. This functionality makes the unit easy to use for small children and adults alike, and creates a hands free, hygienic experience for all users. The pedestal wraps around the unit, making it accessible from every angle. The deep bowl design helps keep the washing area clean by keeping soap and water contained. This line of Bradley Washfountains is covered with a highly durable solid surface material called Terreon®. Other units are covered with Terreon®RE which include recycled materials. Both surfaces last a lifetime, and are easily repaired and renewed. They are molded into their form, eliminating the need for sealants. They are non-porous, and therefore will not support mold, mildew, or bacteria growth. The Terreon®RE surface option is made of 25% consumer recycled granules and bio-based resin. The rest of the unit is composed of heavy duty stainless steel parts which also help increase the strength and longevity of the unit. 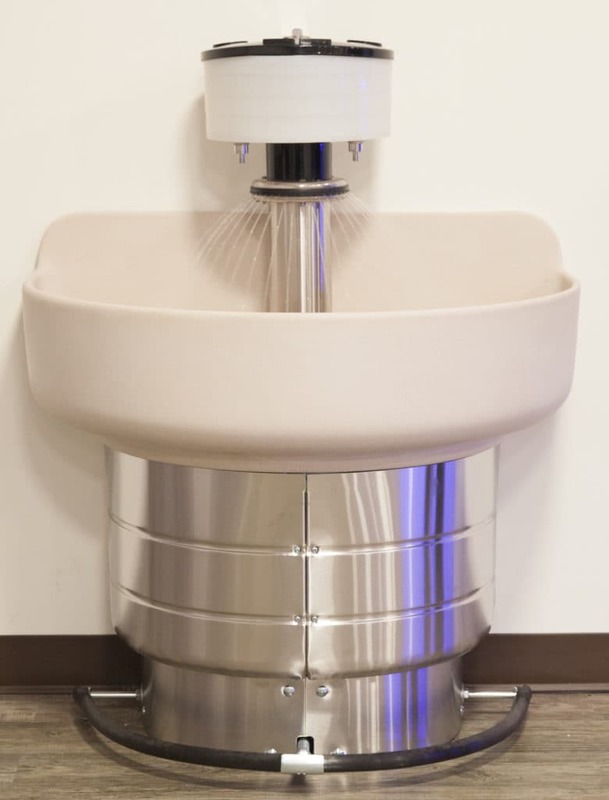 Semicircular and Circular Terreon® Classic Washfountains are ideal for many locations, such as smaller or uniquely shaped restrooms, because they take up less space than on-the-wall singular use units, and require minimal plumbing connections. They can be used as interesting focal points in restaurant, hotel, and museum applications. They are also a great choice for art studios or schools where users may need a larger, more effective washing station for messy cleanups. These washfountains are also perfect in places where groups of people start work or class together, or take breaks together, such as industrial plants and schools. They can also be an aesthetic focal point for patrons. In addition, hands-free use is appreciated everywhere, and water savings should always be a priority, so these units would be excellent for almost any application. To learn more about Bradley Washfountains, stop by our showroom in Oakmont, Pennsylvania (located right outside of Pittsburgh), or give one of our product specialists a call for more information and to order a customized Bradley Washfountain for your facility. We are available by phone Monday-Friday from 7:30am to 5:00pm (EST) at 412-781-9100 or toll free at 800-442-6622. The unit in our showroom is the juvenile sized semi-circular washfountain by Bradley. We also added the liquid soap dispenser which you can see on the top portion of the unit. 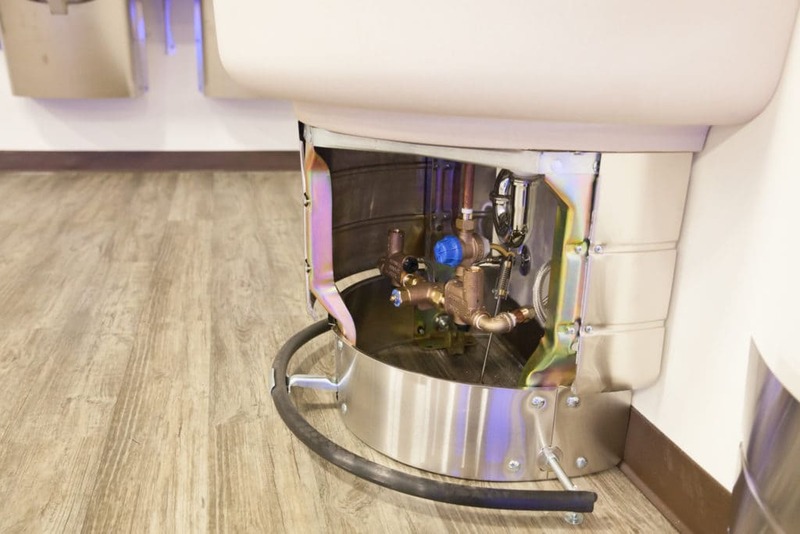 Specifically, the unit shown above is the 36” Semi-Circular Washfountain Foot Controlled w/Thermostatic Mix and Liquid Soap Dispenser (Equiparts Part #: SP15471). We installed the Juvenile sized unit in our showroom in order to save space. This particular unit is ideal for small children and can be used in grade schools, children museums, and other applications for small children. The Manufacturer number for this exact unit is: WF2503-A-STD-F-TMA-LSD-CA-TAN.